No exposed lead terminals to improve environmental safety and health. Do you have questions about our Concorde batteries, or questions about solar in general? Give us a call at 1-800-472-1142. The PVX-340T battery has a copper alloy threaded insert terminal and is supplied with silicon bronze bolts, nuts, and washers for the required installation. This battery has a M6 terminal which has a torque value of 35 in-lb. After 15 cycles rated capacity is stated to be 77°F to 1.75 volts per cell. Product includes a 1-year warranty! No exposed lead terminals . This change was incorporated to improve environmental safety and health. Threaded insert terminals are recessed to prevent short circuits across battery connections. New cover is flat top design. No protruding or exposed vent valves. Built in lifting handles, except PVX-490T, PVX-560T, and PVX-2240L. High Impact Strength Copolymer Polypropylene Case and Cover. Positive Plates - Proprietary Lead Calcium Alloy - Negative Plates - Lead Calcium. Low Self Discharge Rate Approximately 1% per month at 25 C (77 F). Operates over a Wide Range of Temperatures from -40 C (-40 F) to +72 C (+160 F). Classified as "Non-Spillable Battery" for Transport. Most Part Numbers comply with DOT HMR49, Non-Hazardous Materials. Concorde's proprietary, maintenance-free, valve-regulated, lead acid deep cycle batteries employ non-spillable absorbed glass mat (AGM) technology. Immobilized electrolyte and thick lead calcium plates are compressed within a micro-fibrous silica glass mat envelope which provides excellent electrolyte absorption and retention with greater contact surface to plates compared to gelled batteries. This results in higher capacity ratings and cyclic performance. 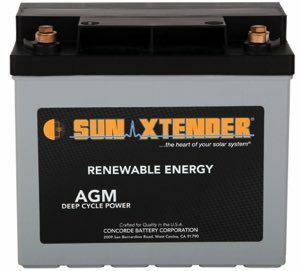 Concorde Sun Xtender batteries have a lower self-discharge rate——five times better than flooded batteries. Expected life cycles are 5000 cycles to 10% DOD, 1000 cycles to 50% DOD. UL listed as a recognized system component. They meet DOT transportation requirements and are not restricted for shipment because they are exempted from hazardous materials category. All have copper alloy terminals and silicon bronze bolts. One year warranty on all concorde batteries. All Concorde products are made at one facility in West Covina, California. Concorde is a family owned and operated company. From start to finish all products are made in the United States.